The Slot step light is great for general low light levels with low glare. Ideal for theatres and auditoriums. With the aluminum faceplate pattern this unit can take abuse and continue to provide great performance. Metal housing with two knock out power entries 7/8” KO. Housing has a white polyester powder coat finish and can be used for concrete pours. Polycarbonate available in white or clear. Captive and recessed stainless steel. Available in 1.2 watt with an integral driver. LEDS are available in White, Blue, Red and Green. They are also available with a narrow, medium or wide beam lens. Drivers are line voltage in at 120 volts. LED’s have a life of 60,000 hours. All drivers are integral 120 volts power in. 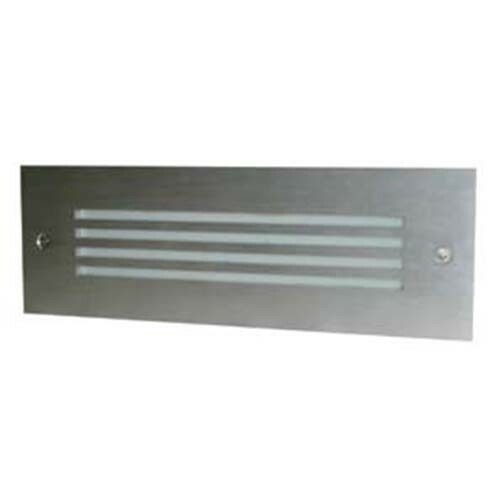 Face plate is made of aluminum with a polyester powder coat finish. All units have a polyester powder coat finish. Standard colours are Sparkle Silver, Charcoal, Black and White. For custom colours please consult factory. For concrete pour only. For indoor and outdoor use.